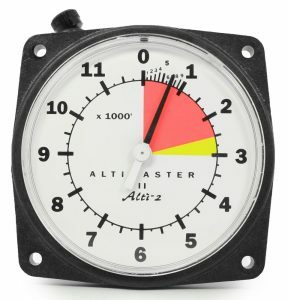 The Altimaster II from Alti-2 is a classic analogue altimeter suitable for both sport and military use. The Altimaster II has a number of features that make it one of the most reliable and most recognisable altimeters on the market. The Altimaster II was originally designed by Stephen L. Snyder over 50 years ago. The Altimaster dial face is internationally recognized. Steve Snyder introduced the Altimaster concept of: 0-12,000′ which was founded on the belief that most people are accustomed to reading a clock face, and that a free fall takes about 60 seconds — one sweep of the second hand. The needle points at the numbers and does not cover them up. A unique version of the Altimaster II was created especially for President George H. W. Bush.